“Pave de Chocolate” is my signature recipe. I kept this recipe as a secret for a long time. It was one of my best kept secrets, now revealed for you to enjoy. It is decadent, creamy, cold and dreamy! This recipe was originally made with “lady finger” cookies but they were really hard to find in the USA back in the day so I substituted for graham crackers. It’s now easy to find lady fingers, but I kept the graham crackers in the recipe. They make the recipe more affordable and delicious. Put chocolate chips in freezer. Pour condensed milk in a food processor or blender add the melted chocolate and mix well, pour in a large bowl, set aside. Put whipping cream in food processor and whip until very fluffy. Add whipped cream slowly to chocolate mix folding with a fork to preserve the air pockets. Cover and place in freezer for 30 min. Mix milk and coffee liqueur in a bowl. Dip graham crackers one by one in this mixture and place in rectangular dish forming one layer. Spread some of the chocolate mousse on top. Repeat this procedure, layering the crackers and mousse until the crackers are finished. The last layer must be of chocolate mousse. Put frozen chocolate chips in a food processor using a shredding blade and shred to pieces. Sprinkle all over the chocolate mousse. Cover the dish and place in freezer for at least 2 hours. Keep in freezer between servings. Make this wonderful cake to serve for breakfast on Thanksgiving day and over the Thanksgiving holiday weekend. A great companion for a cup of coffee or tea. This wonderful moist cake combines the flavors of a traditional American pumpkin cake with exotic Brazilian caramel coconut sauce. Pumpkin and coconut are a very popular combination in Brazilian desserts and caramel coconut sauce is a Brazilian signature, so sweet and loved, its popularly known as “Baba de Moca”meaning literally ” young woman drool”. This recipe can also be vegan if you substitute the eggs for apple sauce and everyone is happy. Pre-heat oven to 350F and grease a Bundt cake pan. In a large bowl beat sugars, oil and eggs until smooth. Add all dry ingredients, then apple sauce and mashed pumpkin,mix well ,if dough seems a bit dry add an extra 1/4 cup coconut or vegetable oil. Pour in Bundt cake pan and bake for 1 hour or until fork comes out clean. Let it stand for 15 min before removing from pan. While cake is baking, melt 1 cup sugar in a sauce until it starts to form a caramel sauce turn heat to low and slowly add coconut milk, stirring constantly until very bubbly and slightly thickened. remove from heat and pour in a glass bowl and let it cool. Sauce will thicken more as it cools. Drizzle sauce over cake and save some in bowl to drizzle over individual pieces. Enjoy! For our Halloween special edition, we made eye balls with pickled red pepper, sour cream and olives. Totally optional! “Brazilian Black Bean Stew” known in Portuguese as “feijoada” is a hearty combination of several different pieces of beef and pork meat cooked with black beans. It’s usually served with white rice, finely shredded and sauteed collard greens , orange slices and garnished with tomato vinaigrette. There are different views about the origin of this dish. The popular view is that this was a creation of slaves that were brought to Brazil by the Portuguese during colonial times. The popular view believes that, once the good parts of the meat were served to the slave owners, the pieces thrown away like the ribs and pigs feet would be used by the slaves and cooked in with the beans in a big iron pot. However, some historians and food connoisseurs believe that feijoada is a variation of other European dishes that combine beans and meat like the cassoulet, which is a combination of white beans and meat substituting the white beans for black beans originated of South America. Others believe it was created in the XIX Century. There has been a lot of changes to the classic recipe for feijoada and lighter versions are very popular without the pigs feet and other unwanted parts. In my recipe, I only use short ribs, chicken sausage and lean ready cooked bacon. Marinate short ribs with balsamic vinegar and sea salt, cover and place in refrigerator. Turn the heat to medium and let it cook for 1 hour. Then turn off the heat and let the pressure built cook for for 30 min. Don’t open the pressure cooker until all steam is completely out. Drizzle some olive oil in a crock pot and transfer the beans. Cover, turn heat to medium and let it slowly incorporate flavor. Meanwhile, drizzle a large skillet with olive oil. Brown the balsamic-marinated short ribs and chicken slices. Cover and let them cook until balsamic becomes a glaze. Add meat and bacon to the crock pot. Turn heat to high and let it cook until beans are bubbly. If beans are too thick, add a cup of hot water. If you don’t have a pressure cooker you can use a crock pot. Start the cooking process the night before. Place beans, water, olive oil, salt, garlic, onion powder and bay leaves in crock pot at medium heat and let it cook overnight. In the morning, add hot water if necessary and turn heat to high; let it slow cook until beans are tender. Then proceed to cook meat and follow same steps. Mix all ingredients in a nice ceramic bowl and garnish individually. It’s just like French fries but way better! Yucca fries are very popular in Brazil made with yucca root also known as Manioc in Portuguese “mandioca.” They can be eaten as a side dish accompanying black beans, your favorite grilled meat or veggie or by itself as an appetizer, a perfect bar food. Cut the skin off the yucca root, chop them in 2 inches size cubes, Put them in a pot with water and le them cook til tender, approximately 20 minutes. Drain water and set aside. Pour oil in a large frying pan and heat oil at high temperature for about 3 minutes. You can test if oil is ready by putting one yucca in hot oil. It is ready hen it sizzles. Using a frying ladle, put a good amount of yuccas in hot oil. Let them fry until golden brown turning them around to brown all sides. Scoop them and let them rest in a bowl with white paper towel to absorb the oil. You may need to do the frying in two batches. sprinkle with salt and it is ready. Enjoy! Meanwhile, in a blender or food processor mix the mashed pumpkin with coconut milk, brown sugar and the spices. Pour over the ginger crumbles pie crust and bake for 50 min. let it cool for 10 min before serving. Garnish with Chantilly cream or your favorite vegan cream. Sprinkle Cinnamon on top. to make Chantilly cream, simply beat whipping cream in a food processor or beaters until fluffy. Add the sugar and vanilla slowly folding with a fork. Place in refrigerator until ready to serve. This dessert is what I like to call a Brazilian Gem! It is absolutely delicious! Tart, creamy and cold! 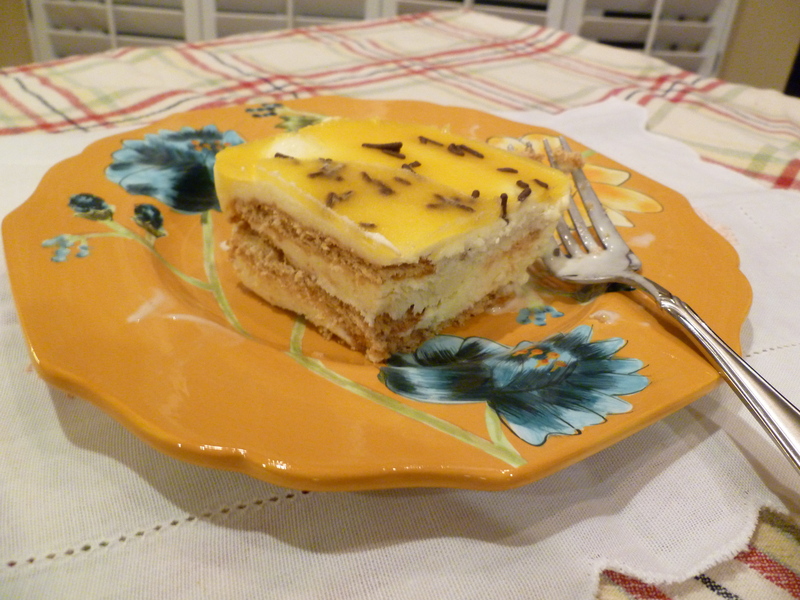 This particular recipe was a bit of a challenge to reproduce because passion fruit and the extract are very difficult to find in most grocery stores in the USA. You will need to go to an Asian market or preferably a Latin American market to find the extract or maybe the fruit if lucky. I have seen the fruit occasionally in stores but not often enough to be available for when I need it. However, Passion Fruit juice is available everywhere but it is very sweet and has a low percentage of the real juice. It is very weak to bring enough of the tart passion flavor to the recipe but I think I found a solution in lemon juice. Lemmon juice brings the flavor in the passion fruit juice to that similar tart flavor taste from home. This recipe is very easy to make but requires some extra time to achieve consistency. Make a day before planing on serving. 1 cup passion fruit juice plus 2 tbsp lemon juice. 1 box Honey Graham crackers. 2 cups passion fruit juice. passion fruit seeds or chocolate sprinkles. Remove the pulp of the passion fruit with a spoon. Place pulp in a strainer over a large glass bowl and smash pulp with the back of the spoon pressing the juice into the bowl , save the seeds. Add condensed milk and whisk. Or…. …In a large glass bowl whisk condensed milk and passion extract or passion fruit with lemon juice. Set aside. In a food processor, whip cream until fluffy. Slowly fold whipped cream into passion fruit mixture. It will look lumpy. Cover with a plastic wrap and place in freezer for 1 hour. Meanwhile, mix 1 cup of the passion fruit juice, lemon juice and sugar in a sauce pan and whisk over medium heat, bring to a boil . Set aside and let it cool. Then, pour this syrup into a container cover and place in refrigerator until needed. When hour is up, remove mousse from freezer and fold with a fork ,scraping the sides. Place in freezer again for 1 hour. Keep repeating this procedure until mousse is a consistency of a soft ice cream, not frozen. To assemble, put 1 cup of passion fruit juice in a bowl. Deep Graham Cracker cookies in ths juice one by one arranging them on the bottom of a rectangular glass dish approximately 9 x 11 inches. Spread some of the mousse on top and place another layer of crackers deeped in juice. Keep repeating this procedure until mousse is finish. The last layer should be of mousse. Cover with plastic wrap and place in freezer for at least 2 hours. 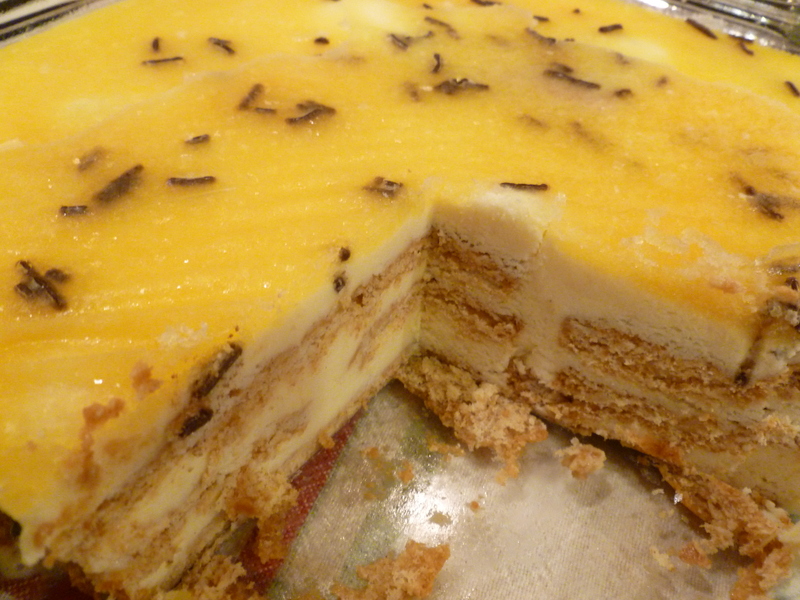 Once top is frozen, pour the passion fruit syrup that was chilling in the refrigerator over the top, sprinkle the passion fruit seeds or chocolate sprinkles over it. Cover and place it back in freezer for at least another 2 hours or overnight. Remove from freezer 10 min before serving. Keep in Freezer.